The Interview Blues – What is your Favourite Website? There is a famous saying “Everybody wants to go to heaven, but nobody wants to die”, the same rule applies when we want to work. We all want to have a dream job, but the interview is the last thing we want to engage in. Actually, interview stirs up series of emotions within us. After receiving the interview call, we feel excited, elated, dreadful and anxiety, all at a time. These waves of emotions turn into tsunami on the day of the interview. This emotional turmoil can make hard for us to answer the simple questions which we know very well. 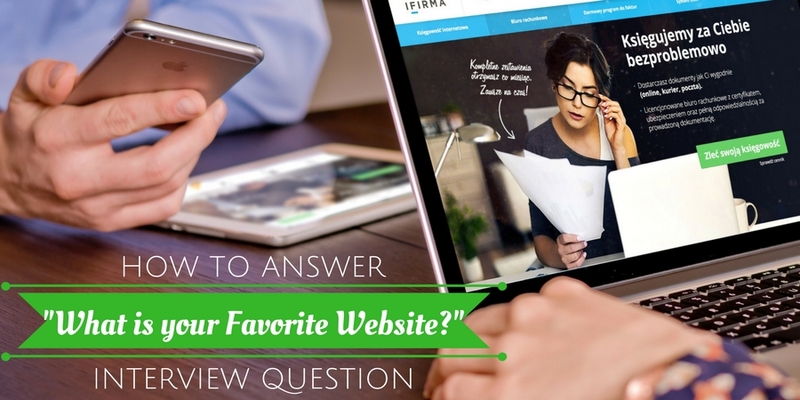 So before we tell you how to answer the tricky question, what is your favourite website? Let’s chalk out the timeline which we are going to discuss apart from this question and blow away all your interview blues by briefing you on the following topics. Finding the answer to question- What is your favourite Website? Interview questions are not as simple as they sound. Instead of judging them on their face value you should analyze the reason they were asked. The interviewers are savvy in acquiring the deep knowledge about you through fewer questions only. They are honed with the ability to read between the lines. When you say your favourite website is Facebook, Instagram or twitter, it reflects that you like to entertain yourself. Enjoying oneself is not bad but it can be wrongly intercepted by the interviewer that you would waste your time more than you should at work. When you say, you spend your time studying and writing the answers on Quora or reading articles on WebMD or Techcrunch, it shows that you are an intellectual person and believe in constantly improving your knowledge base. An interviewer may see you as a person who will take initiative to learn things. When in your answer you highlight websites like tripoto or lonely planet you may reveal that you are a traveller inside. You love to explore new destinations. Though travelling in vacation can increase your job potential but how your employer would respond to it is limited to his thought process. When you say your favourite website is HuffingtonPost, economic times or BuzzFeed, it can tell the interviewer that you are concerned to know what’s going on in the world beyond you and your known ones. The interviewer may solve the puzzle about a few of your personality traits with this question which is asked most of the time. So when you actually calculate the maximum time spent on a website, you land up with options like Instagram, Facebook, Twitter, Pinterest, YouTube and other social media platforms. Few of these websites are also entertaining, but apart from that, there is news around the world. So by mentioning websites like these, you can present a blend of entertainment and education. You may not like HuffingtonPost as much, but instead of mentioning a social media website and blowing it all, you should play safe. The key rule to be followed with this question is to unveil that you believe in enriching your mind in lieu of wasting your time. The battle of success in interview lies far beyond the questions and answers. Therefore, after knowing the answer to a typical question boggling your mind, have a look at the following interview essential mentioned below in different pointers to fade away the interview blues. Proper preparation for the job interview is half battle won. So before you go for the interview you should try to be adept with the following points to keep yourself calm and on the track which leads to success. You should give adequate time to research about the company. This doesn’t mean that catching a glimpse of their web page is enough. You need to study the latest press release, editorials, annual reports and even the profiles of the top members of management, their vision and mission. Knowing the vision can help you quote it with your answers. Like if you are going for an interview in a radio company, you can say, “I can help you to reach the target of 500,000 listeners in the city which you are planning to aim.” Researching about the company may even give you a picture of the work environment and about the number of employees. You can share your answers in this light. If in case you are informed about the interviewer’s name in the interview mail then you must act like James Bond and extract all information about him with the social media platforms like LinkedIn or Facebook. By this, you would be able to know what their personality and experience are and after knowing a bit about interviewer you will feel more confident when you actually have a face to face interview with them. There are few set of questions which are like synonyms to interview, viz. tell about yourself, your weakness and strength and why should we choose you. So prepare for them wisely. Some people even mug up the answers for questions like “tell about yourself” from internet or from how to crack an interview book. This leads to a major problem as it is easily identifiable. The interviewer thinks, when you do not know yourself much, how can we know about you and hire you in the company. Therefore be wise and apt about the answers. Apart from the questions which you have to answer also prepare the questions which you have to ask the interviewer about the company. This leaves a very optimistic effect on the interviewer that not only you are engaged in the interview, but are quite inquisitive about working with the company and see yourself filling the place. All the documents which you have submitted with the job application must be photocopied for creating two to three sets. Though your interviewer may bring along the copy submitted by you but in case he forgets you must have the copy handy. This can impact him that how organized you are. Being one step ahead can directly show your future planning. There are few people who feel they are the most apt person to be considered for the job. They feel after putting a stellar resume that it is enough for their selection. Also, there are people who may prepare well, but miss out certain points. Both these people after following the prerequisites of interview preparation should avoid making the following mistakes. Practicing the questions which you would be asked can make you more confident about yourself. A mock session may sound childish for a few, but it actually wipes out all the chances of being incorrect in the interview. Practicing with someone close helps you to prepare to the utmost level of your capabilities. You may even record this session to know how you sound. You may further improve on what you are lacking. This can actually help you to cope with nervousness which is the rival of success in the interview. It makes you a jittery and slow thinker. Nervousness is the culprit that makes you fumble and even sometimes shake in fear which reflects that you are not fit for the job. So when you have a mock interview you can overcome the nervousness. Focusing on weakness can damage your emotional well-being and negatively affect the body language and thought process. You cannot overcome weakness in a few days, so instead of paying attention to weakness work on your strengths. For shunning the chance of being overcast by weakness, the best thing to remember is that nobody is free from loopholes even the most successful person will have weakness. When people apply for a profile which is reasonably above the hierarchy, they forget to be polite with the receptionist. While making any phone call or after reaching the office for the interview they show a very pompous behavior to her. Please keep in mind if this behavior is noticed or conveyed you may lose the chance of being on a roll with the company. You grasped much of information about the company from different sources, but forget the name of the company’s website which should be at your fingertips. This is not less than crime in the interview. This is the most common mistake which most of the people do with the hassles and anxiety of the interview. When you go empty stomach you tend to be less attentive. Eating a food rich in vitamin E, omega 3 and antioxidants can help your brain stay alert. The guarantee of success is ambiguous, but sidestepping the unprofessional approach and adopting a solid professional strategy can be a win-win situation. Following are the ways you can look professional. Submitting and carrying that age-old resume for the interview is unprofessional. Design your resume with style covering each and every part and avoiding the lengthy paragraphs of all your jobs, even the minutest ones. Also, dodge the job which you cannot add to the accomplishments list. Additionally, do proofreading of your resume for putting a check for typing errors, grammar goofs and other factual errors. Errors in the resume are highly unprofessional and can cost you your dream job. Your attire can speak volumes about you. So stick to the formal dress for the interview to present a professional image of yours. Unless it is an interview with a fashion magazine please avoid any casual wears. Neutral colours like black, brown, gray and blue are most appropriate for both men and women in the interview. In addition to the dress, complete your attire with shoes and not flip flops of any kind. When you slouch back while sitting or entering the interview room, you send a very negative impression to the employer. Also, sitting in the interview with legs splayed apart, or keeping hands behind the head is all considered unprofessional. Keeping your arms crossed over your chest has always been a no-no in an interview as it conveys that you are not open about yourself in the conversation. Always sit straight with your torso facing the interviewer, sending the message that you are keen on the job. Any facial expression in excess of the neutral reaction must be avoided. Try to be in the middle of the road, while being too smiley can make you look dumb and even others may sense something fishy from your behavior, on the other hand being too serious or stone-faced can make you look like the sack of troubles. Nobody is interested in a fake person so stay pleasantly neutral. At the end, we would just say that every interview is focused on finding some unique requirement so by being level-headed and keeping in mind all the above solutions and tips, you can crack any interview easily.